Porteous’ Studio is a simple, Architect designed holiday home in Edinburgh. 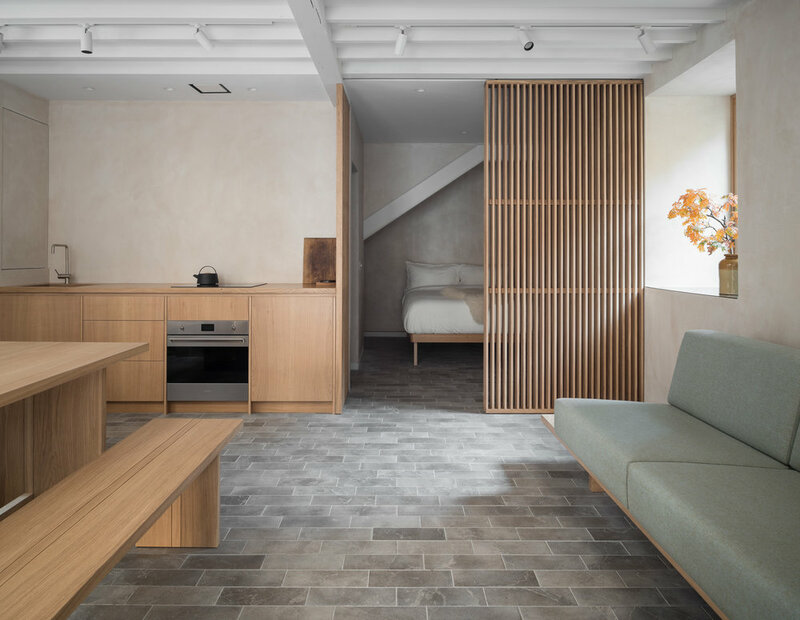 The studio is designed as a quiet retreat for two people to rest after a busy day exploring the city. The design of the space includes an open kitchen and living area, a bedroom with double bed and separate shower room alongside a handful of amenities including hand and body skincare and a breakfast hamper of fresh, local ingredients. Porteous’ Studio is constructed from natural products which create warm, peaceful and tactile interior. The natural clay plaster walls regulate humidity levels to the optimum human comfort range and create a calm atmosphere and the velvet limestone tiles sit softly with the cobbles outside and the underfloor heating keep feet cosy at all times. The furniture has been crafted from a single oak tree from East Lothian and sits with presence in the space. Once you arrive in Edinburgh and made your way through the winding, wondrous streets of Old Town to the bustling Grassmarket, you’ll find Porteous’ Pend in the shadow of the most spectacular view of Edinburgh Castle and the studio nestled within - your holiday begins. Please go to our Book Your Stay page for a detailed description of what is provided for your holiday.